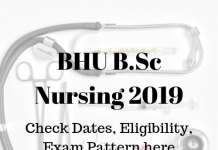 BHU UET Cut Off 2019 will be released in June 2019. Banaras hindu university will release the Cut off on its website after the declaration of the result. BHU UET Cutoff will carry the minimum of the marks which the candidate will be required to score in order to qualify the entrance exam. Go through the details of BHU UET Cut Off from the article below. It should be noted that the University will be releasing a separate cut off list of marks for each course. Candidates will be able to go through the marks to be scored for the course they have applied for. There are various factors for determining BHU UET Cut Off such as the total number of candidates who applied for the exam, Level of difficulty of the examination, Pass Proportion of the candidates and number of seats available in the course. Candidates who appeared for the BHU UET entrance exam will be able to check the last rank at which admissions will be offered. The BHU will also release the UET Entrance cut off marks along with the cut off rank. The admissions to UET Programs will be offered to only those candidates who will secure the cut off marks or cut off rank. On the basis of this candidates will be called for the counselling. Candidates will be advised to make themselves aware with the calculation of marks and how the marking will be done in BHU UET 2019. There will be 150 questions of 450 marks. For every incorrect answer one marks will be deducted from the total score of marks. However, it should be noted that if more than one option is marked negative marking will be done. There will be no marks for an unattempted question. Banaras Hindu University will release the BHU UET Result. Candidates who have successfully appeared for the entrance exam will be eligible to view their result. The Result will contain the marks scored by the candidate in the entrance exam as per their performance in the test. The admission to the preferred course will be granted on the basis of the marks and merit secured by the candidate. BHU will release the Merit List on its official website after the declaration of the result. The University will be alloting a rank to every candidate as per their performance in the entrance exam. The Merit List for UG and PG courses will be released separately. A Merit List will be prepared by the University based on the marks scored by the candidate in the entrance exam. Candidates will be called for admission procedure as per the rank achieved by them in the Merit list.